With the first warm days of spring, in villages all over Turkey, families begin to think about moving to their summer residences on the cool summer pastures called yaylas. The yayla, or meadow, high in the mountains, provides a different pace of life during the hot months and insures sufficient grazing for the herds of sheep, goats and cattle. The migration from winter village to summer encampment is a legacy from the days when Anatolia was populated by nomadic and semi-nomadic people. Although the yayla’s importance as a refuge from mosquitoes and malaria is no longer relevant, the annual migration still secures new food sources for the animals, and offers villagers relief from the sweltering heat of the lowlands and coastal areas. Everything required for the summer must be carried to the yayla and this make enthusiastic and exhaustive preparations necessary. Clothes, tents, furniture, cooking equipment and bedding are all packed and loaded into cars and trucks for the long drive to the often remote location. Herds of cattle, sheep and goats make the slow trek on foot guided by boys and young men. Season after season, each village moves to its own particular pasture land. After reaching the yayla the convoys disperse, with the families setting up their own tents. In some areas, in the Black Sea Region for instance, the summer settlements are made of permanent structures with each family moving into their own wooden chalet year after year. 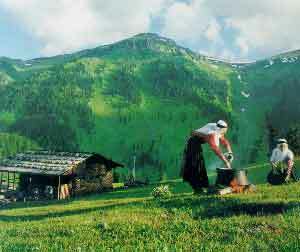 Once everything has been arranged, the villagers adapt quickly to the different pace of life during summer in the yayla. The whole family wakes up at first light. The men early with the herds, while the women attend to such domestic chores as preparing meals, making cheese and gathering plants for dyeing wool. The children help out in all the activities on the yayla. After the women have milked the animals, it is time to turn the milk into yogurt and butter. When the men and boys return in the afternoon, the families gather to enjoy their main meal, often comprised of hot cracked-wheat based dishes accompanied by ayran, a delicious drink of salted yogurt diluted with water, as they relate the day’s activities. In the evenings the yayla comes to life in spontaneous gathering to sing traditional songs, enjoy folk music and dance, and recount hilarious jokes and long stories. 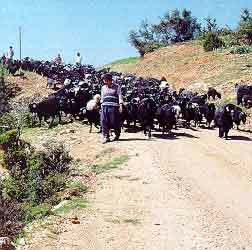 The attraction of the quality of life on the yayla is so rooted in village life, that even those who do not earn their living from farming make the yearly pilgrimage. Today, the encroachment of modern life on the yaylas is carefully monitored so that the essential character of this way of life is preserved. The permanent housing, that is gradually replacing the black goat hair tents, is designed to blend in harmoniously with the natural environment, while offering the conveniences of modern life. 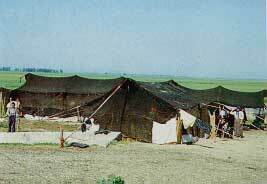 In some yaylas houses with kitchens, toilets, water and electricity stand next to a wide expanse of black tents. The arrival of shops stocked with provisions and other necessities means that it is no longer necessary to bring all the food stuff from town. The construction of new roads makes the journey to these remote locations much shorter and less arduous than in former days. Indeed, public transportation services are available on some of the more accessible summer plateaux. 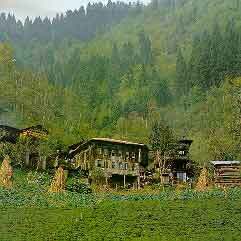 Time spent on the yayla is particularly suited to a holiday of relaxation and the enjoyment of nature. You wake up each morning startled at the tranquility and heart-stopping splendor of the surrounding landscapes. Whatever your interest – butterflies, wild flowers, birds or other animals – leisurely walks in the rolling meadows and through the pine forests will provide a welcome change from city life. In surroundings free from the harsh glare of urban lights, night watching and star-gazing take on new meaning. For those who want a more active holiday than strolling through tranquil pastures and capturing magnificent views on camera, the yaylas can offer more energetic activities. You could try grass skiing on the vast meadows, trekking or mountain-climbing. In some areas white-water rafting is possible. After exerting yourself to the desired degree, you can enjoy the simple but exquisite fare of yayla meals. Fresh milk, cheese, honey, butter, bread, hot yogurt soup, nourishing stews and wheat dishes satisfy even the most sophisticated palate. In the evening you too can settle down to the community and friendship of an open fire, songs and long tales. The most popular destinations for this holiday are the Black Sea Region’s and The Mediterranean Region’s Plateaus.